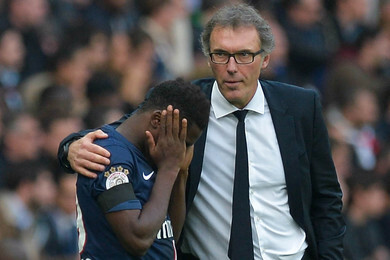 Paris St.Germain coach Laurent Blanc has forgiven Cote d'Ivoire defender Serge Aurier, which makes him available for selection in their next matches. The former France international defender turn coach said he was shocked by his right-back's comments and has now given him a chance to make amends. The 23-year-old defender made disparaging remarks about Blanc and several of his PSG teammates during an ill-advised Periscope session. However, the Elephants international made a public apology after being suspended by the club and he was then forced to train with the French champions' reserve team for three weeks. Speaking to France Info radio station on Thursday, Blanc said he had not been shocked by his right back's comments. "Shocked, no, you know that nothing shocks me anymore,” said Blanc. "Hurt, yes. Hurt because I honestly think that this guy did not choose his words carefully...so it was necessary simply to remind him." Aurier's suspension meant he missed both of PSG's games against Chelsea in the Champions League round of 16 but he could now be back in contention for their quarter-final tie against Manchester City. Ahead of Aurier's return to training at PSG, Blanc said he could not yet confirm whether the player had understood the message that the club had delivered to him. "I don't know, I hope he has. I'm not sure. I told him what I had to say and that's why I wanted to meet him,” added the 1998 FIFA World Cup winner with France. "I didn't want to meet him to hear what he had to say to me. I wanted to meet him so that he would listen to what I had to say. "He's rejoining the squad and he should be considered as a squad player. Nothing more, nothing less." Meanwhile, Aurier played one game with PSG's youth team, who play in the French fourth division since his punishment, but also played for Ivory Coast in the 2017 Africa Nations Cup qualifiers against Sudan last month.